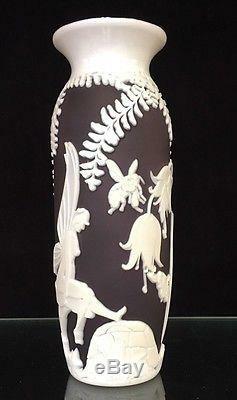 Fenton Carved Cameo Vase "Spring Fairy". Kelsey Murphy /Robert Bomkamp Design. Dimensions: Approximately 11 in height; Circumference at widest point: 10. Kelsey/Bomkamp signatures are on bottom of piece, as well as Fenton logo and numbered 64/175. Thanks for visiting The Bronze Look find us on the web or shop in town at Diamonds-n-Gold Look!! We have many other items to be listed! Stay tuned for more unique gifts and collectibles! MESSAGE US WITH YOUR REQUESTS! Add a map to your own listings. 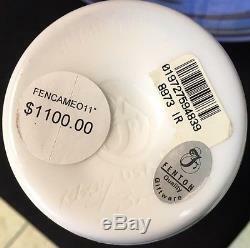 The item "Fenton Carved Cameo Vase Spring Fairy- Murphy /Bomkamp FROM THE BRONZE LOOK" is in sale since Saturday, May 5, 2018. This item is in the category "Pottery & Glass\Glass\Art Glass\North American\Fenton". The seller is "bronzelook" and is located in Princeton, West Virginia. This item can be shipped to United States, Canada, United Kingdom, Denmark, Romania, Slovakia, Bulgaria, Czech republic, Finland, Hungary, Latvia, Lithuania, Malta, Estonia, Australia, Greece, Portugal, Cyprus, Slovenia, Japan, China, Sweden, South Korea, Indonesia, Taiwan, South africa, Thailand, Belgium, France, Hong Kong, Ireland, Netherlands, Poland, Spain, Italy, Germany, Austria, Israel, Mexico, New Zealand, Singapore, Switzerland, Norway, Saudi arabia, Ukraine, United arab emirates, Qatar, Kuwait, Bahrain, Croatia, Malaysia, Brazil, Chile, Colombia, Costa rica, Panama, Trinidad and tobago, Guatemala, Honduras, Jamaica, Barbados, Bangladesh, Bermuda, Brunei darussalam, Bolivia, Ecuador, Egypt, French guiana, Guernsey, Gibraltar, Guadeloupe, Iceland, Jersey, Jordan, Cambodia, Cayman islands, Liechtenstein, Sri lanka, Luxembourg, Monaco, Macao, Martinique, Maldives, Nicaragua, Oman, Peru, Pakistan, Paraguay, Reunion.